Welcome to Escola de Inglês - Air English School: Trade or Freedom? It`s now the highest. One World Trade Center a. ___________ (to become) New York's tallest building, overtaking the Empire State Building, after a steel column was lifted into place. The World Trade Center project b. ____________ (to suffer) several delays over designs and naming. The building, construction of which c._______________ (to begin) in April 2006, will be 1,776ft tall when completed. 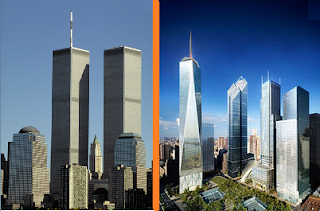 The World Trade Center's twin towers were destroyed on 11 September 2001. The skyscraper, dubbed Freedom Tower, d.__________(to become) the tallest building in New York a day before the one-year anniversary of the operation that killed Osama Bin Laden.